Perfect Benzo- Perfect Cropscience Pvt. Ltd. Advantages: Perfect Benzo is a non-systemic insecticide which penetrates leaf tissues by trans-laminar movement. 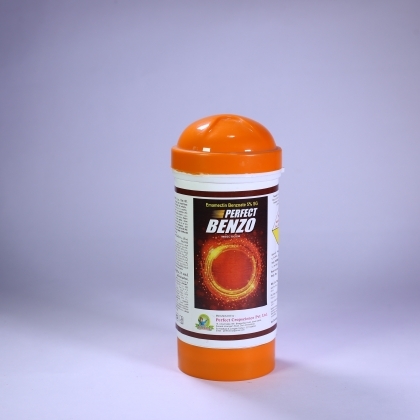 Benzo belongs to naturally occurring evermectin group of insecticide is good for controlling Lepidoptera such as bolloworms in cotton and fruit and shoot borers in okra. Dosage: 12 to 15 Ml with 15 Ltr water for any type of kathiri & 17 to 20 Ml with 15 Ltr water Thrips control. Available Packing: 10 Gm, 50 Gm, 100 Gm, 250 Gm.